When placed into the mouth of a decanter the aerator diffuses the wine as it is poured into the vessel. Wine cascades down the decanter and is effectively aerated. 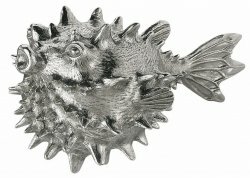 This aerator is inspired by sea creatures and completely made of pewter. The Puffer is meant for wide mouth decanters.